So many Americans have now watched in dismay for two years, as the so-called “Russian Collusion” matter (it never was a legal “case”) has been perpetrated against our duly-Elected President. It has been shameful and as more and more is revealed, likely criminal. Built on a fake dossier used to fool the highest standards of the FISA Court, outright lies by those entrusted with the safety and security of our Nation. These two years have made a shambles out of the presumption of innocence and “equal protection and equal application under the law”. This should be of the greatest concern to all Americans, no matter the party affiliation. It has torn us apart, all of it aided and abetted by the so-called “fair press” that has demonstrated to us that they are anything but fair. On Sunday, April 7th, Devin Nunes, who is the top Republican on the House Intelligence Committee announced that he would deliver criminal referrals this week to Attorney General Barr. This week Attorney General Barr testified that something does indeed seem foul. Indeed. By now many of us have watched as the Democrat Party’s spin-meisters have begun to writhe, spin and cast aspersions on Attorney General Barr and anyone who might truly want to get to the bottom of the real Russia Collusion story. 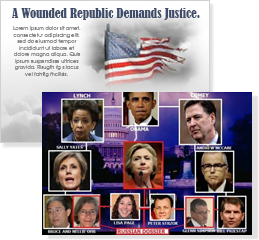 Now is the time to demonstrate our support of the Attorney General and the need to fully investigate and prosecute those people who very well might have pulled off an American “Coup d’état. This is neither a Conservative or Liberal thing – this was a fundamentally un-American thing! Let the Attorney General know that you support him with a flood of postcards sent directly to his office. Order your CauseCARDS here and now and we will send them for you. Treat yourself to current Conservative News and Commentary conveniently delivered all in one site, right to your computer doorstep. Your comments and observations are welcome at rich@CauseACTION.com.